The U357-025-2 Dual-Bay USB 3.0 SuperSpeed to 2.5 in. 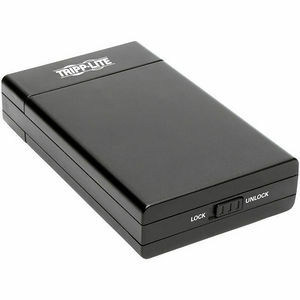 SATA Portable Hard Drive RAID Enclosure is a quick, easy way to connect two SATA HDDs (Hard Disk Drive) or SSDs (Solid State Drive) to your laptop, netbook or notebook's USB 3.0 port. Not only does it support USB 3.0 data transfer rates up to 5 Gbps, but it reads data up to 70 percent faster and writes up to 40 percent faster than USB 3.0 when connected to a UASP-enabled host controller. Perfect for portable storage or backing up system data, the compact enclosure is compatible with 2.5-inch SATA drives up to 2 TB (and will support larger drives when available). RAID 0 (mirrored drive), RAID 1 (single drive) and JBOD (dual drives) disk modes allow flexible access to your storage and are easily selectable via DIP switch. No tools are required, making the U357-025-2 an ideal choice for quick on-the-move storage. The U357-025-2 accepts SATA III, II and I drives and is backward-compatible with previous USB generations. No software, drivers or external power supply is required; connect the included USB power cable to your computer or USB charger to power on the unit. Compatible with any USB-enabled operating system. USB 3.0 A to Micro-B Device Cable, 2 ft.
USB A to Micro-B Power Cable, 2 ft.